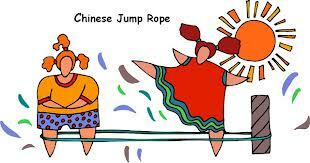 When I was in elementary school I was totally obsessed with Chinese Jump Rope..But like many childhood games, I grew up and completely forgot this game. Last week a friend from my childhood reminded me of my love for this awesome game. The years I was into this game had to be 3rd to 4th grade 1964-1965. We (my sister and I ) didn't have a real Chinese Jump Rope..we had a skinny long piece of elastic my grandmother gave us. It worked just fine. 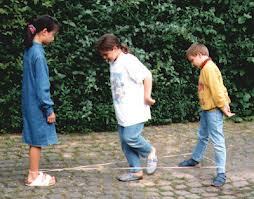 Since there were only 2 of us and you need 3 to play...we tied the rope around a pole in our basement. That worked great too. We spent many hours perfecting our jumping which really was more like ballet dancing. Chinese Jump Rope is a jumping game popular throughout the world! Chinese Jump Rope is no ordinary "rope skipping" game. "Enders" hold an elastic rope while a "jumper" jumps the rope in special ways. The challenge? To jump successfully! Author and former physical educator Sheree S. Marty explains the ins and outs and the side by sides of the game in her eBook Chinese Jump Rope, available for purchase at Amazon HERE. The game is typically played by three players (although more can participate) with a rope (or, more frequently, a string of rubber bands) of about 5–6 feet in length that has been tied into a circle. 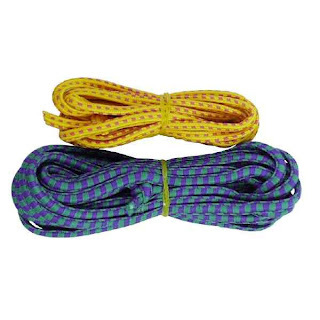 Two of the participants (holders) face each other about 3 feet apart, with their feet together, and position the rope around their ankles so that it is taut. The third player (the jumper) then stands between the two sides of the rope and must accomplish a specific series of moves without making an error or pausing. The game begins with choosing the jump pattern to follow and with the holders holding the rubberband around their ankles. There are many jump patterns and most are accompanied by a song. This is sometimes called the "first level". The jumper tries to complete the chosen pattern. If the moves are completed successfully, then the rope is moved farther up and the series is repeated. When the rope gets too high for a normal person to jump over it, the player then kneels and uses his or her hands instead. Some people just stop the game at this point, as the game is much easier when using hands. If the jumper makes a mistake, players rotate their positions and the next player becomes the jumper. Once the player is finished, that person switches with one of the other people, and so on much, until everyone has been able to play. Chinese Jump Rope is a universal game. It has been popular for many years, certainly since the 1960s, in the United States. German speaking children call Chinese Jump Rope Gummitwist, and it is popular among young girls in Germany, Austria, Italy, Turkey and countries of ex-Yugoslavia. 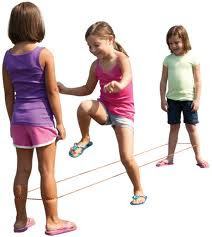 In New Zealand, Australia and Great Britain children refer to the game as "Elastics". It is also known as skip-tape. Estonians call this game "kummikeks", the meaning of which is most similar to skip-tape. In ex-Yugoslavia children commonly refer to the game as Last iš (a rubber band). Check out HopStic who is a US company manufacturing Chinese jump rope in the US. Their site is www.hopstic.com and you can find routines, instructions, and some great ideas. They have totally cool colors, too!